As we have seen from our August blog posts on the Biblical Astronomy of the Great Pyramid and the Great Sphinx, major elements of the Giza Plateau have much to say regarding Biblical Astronomy in general, and the birth and Second Coming of Christ. The Dendera Zodiac is another key aspect of Biblical Archaeo-Astronomy on the Giza Plateau that adds important elements to this narrative. The following discourse is taken from a excerpt on our [try-god.com] website study on the Ancient Egyptian Star Names of the Dendera Zodiac. A key point of this study plainly shows the obvious parallels between the themes and star names of the ancient Egyptian and Hebrew Zodiacs. This evidence stands on its own in support as a powerful witness to the themes of Biblical Archaeo-Astronomy and the Celestial Gospel. 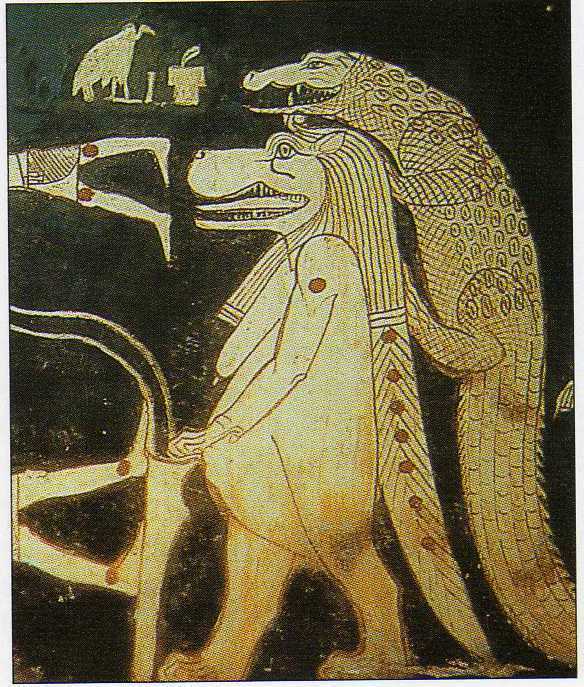 But this is not the whole story concerning the Dendera Zodiac. As is the case with any zodiac or star map, the axes of the Cardinal Directions must be known to provide our bearings. It is the lines of the equinox and Solstice, that always show us the Cardinal Points of the compass to the North, South, East and West. Recognition of the axes of the Dendera Zodiac provides even further evidence supporting our case, along with some unexpected eye-opening revelations. Lets take a closer look at these axes. 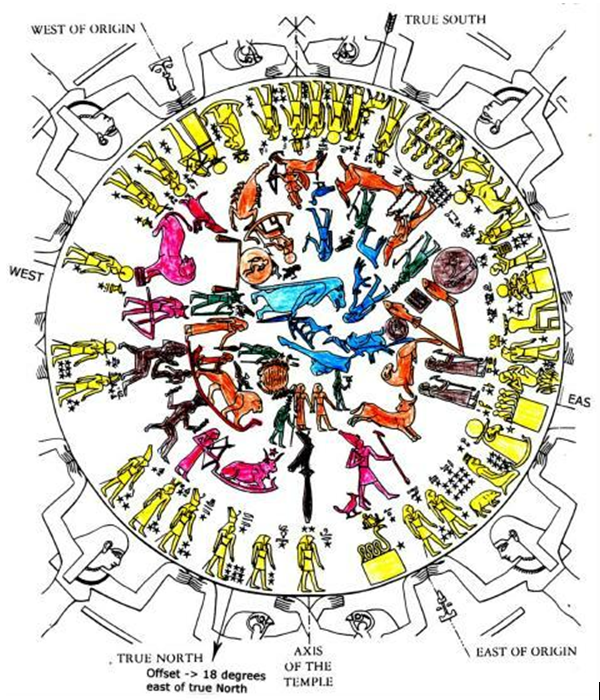 The Dendera Zodiac records the clockwise motion of the Sun focused primarily on the Sun’s annual cycle through the 12 houses of the ecliptic during the year. This represents one level of truth related in the Celestial Gospel, but there is more. As we mentioned in the full website article, there is strong evidence that the ancient Hebrews and Egyptians were also aware of the slower precession of the equinoxes showing knowledge of the Sun’s longer counter-clockwise motion on the ecliptic. The Dendera Zodiac provides fascinating proof of this, corroborating the themes already expressed in the Sun’s annual cycle. This structure is intended as a check and balance of sorts, supporting what we have already learned in the witness of the Sun’s annual cycle of the year. The Sun’s precessional movement is highlighted by which sign of the zodiac it rises in, at the spring equinox. For the last 2000+ years the Sun has risen in Pisces, thus we are presiding in final 200 years of the Piscean Age according to the Sun’s 2,160 year precessional cycle through each of the 12 zodiacal signs. The Dendera Zodiaque, a bas-relief from southern Egypt on display at the Louvre, in Paris; this zodiacal artifact preserves in clear and coherent form the complete pattern of the World Ages. This unique zodiac encoded with ancient Egyptian astrological myth preserves the wisdom of forgotten ancestors who understood secrets of temporal symbolism. Designed as a time-dial, it reveals a precessional pattern of spiritual history over nearly 26 millennia. The Ages of Precession as seen in the chart below, are engraved on the Dendera Zodiac in pictures cross-linked to specific stars giving end time prophecies of a Coming Redeemer of Mankind, resulting in an over-arching agenda, and visionary overview of the Creator’s plan to restore humanity in fellowship with Himself. The Dendera Zodiac demonstrates secrets of the full 26,000-year cycle of precession, including end-time prophecies of the birth and return of Jesus Christ in the Piscean Age. What do the axes of the Dendera Zodiac tell us? Axis E or what is called the fifth axis of Dendera’s Zodiac points ahead to our time, not only because its designers foretold of man’s Coming Redeemer, rather it prophecies of the end-times while highlighting the climax of the entire 25,920-years of the precession the equinoxes, where we inhabit the last 200 years of this cycle. What people have for the most part missed in the study of this ancient Egyptian Zodiac is that Axis E extends from the brightest star in Virgo–Spica–Al Zimach, on one end of this circular zodiac, through the Sign of the two fishes of Pisces at the other end of this Zodiac, uniquely linking the two elements. As Axis E specifically marks only one of the two stars on the entire Dendera Zodiac, it points out the critical import of the star Spica, signifying the Coming Lord Jesus Christ like no other Star in the heavens. As Axis E aligns with the 2 fish of Pisces in context of the precession of the equinoxes, it points out the precessional age where important signs involving Spica would occur both at the start and near the end of the Piscean Age. As we find in the chart below, the Age of Pisces links to the birth and return of Christ, in the Spiritual Age of Grace. We find these details illustrated in Figure 2. below. Above is a close-up view of Axis E, the fifth axis on the Dendera Zodiac [DZ] . Others have omitted some remarkable features of this axis, which we elaborate on below. The DZ registers the oldest known calender date, 4241 BC. On that basis alone, this artifact is unique in the world, but it also exhibits several remarkable features not found in any other ancient relic. It displays the comprehensive framework of precessional Ages foretelling of the end-times. Studies in archaeo-astronomy based on this framework correlate with Hindu, Egyptian, and Mayan calendars, so that cosmic timelines agree into the modern era. A Biblical version of this narrative shows this comprehensive framework of precessional ages, mirrored in the Creator’s plan of redemption, taking human history from its fall in Eden’s Original Paradise back to perfect fellowship with God, restored through the work of the prophesied Coming Redeemer-Jesus Christ, the Promised Seed., in a Final Paradise. The following chart shows how these Precessional Ages correlate to Biblical Administrations, revealing a consistent progression of themes as God’s Plan of the Ages unfolds. This provides the overarching context for the plan of redemption and restoration of Mankind, through the redeeming work of Christ-the centerpiece of the Ages. Our TIMELINE section on the [try-god.com] web-site goes into greater detail, explaining the significance of these age-times in God’s Plan. This march of the precessional ages is recorded in the Dendera Zodiac, in a recognition of the axes built into its structure. 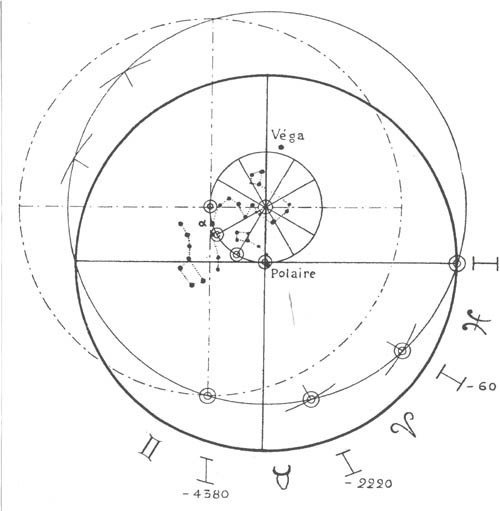 The primary axes of the Dendera zodiac are indicated in Figure 3. below, from Schwaller De Lubicz’ seminal analysis of this zodiac, showing the coordination of the precession of the poles with the precession of the equinoxes. As the pole star recedes from the star Thuban of Draco to the current pole, in Polaris of Ursa Minor [little bear] in the center of the graphic, we can see the related precessional ages/years BC marked on the outer circle. The fact that the ancient Egyptians recognized these two poles and their inter-relationship itself, bespeaks a knowledge of the precession phenomena. The role of a Biblical Archaeo-astronomy approach to this subject, in one sense, separates the symbolic details linked with the idol entities of the Egyptian Star Religion, that corrupted the original unity they shared with the Hebrew Star names, as we have witnessed and documented in our full website study on this topic. Astrology as had a vast corrupting influence on the idea of the precession of the equinoxes. By idolizing the zodiacal signs and blurring the link between the shorter clockwise, and much longer counter-clockwise solar cycles, Astrology not only lacks the ability to accurately distinguish when one precessional age ends and a new age begins, but a clear concept of the relationship between these two zodiacs [tropical and sidereal] is totally lacking of any standard, and no astrologer seems to agree as to the coordination of these two zodiacs. They are thus left in a free-for-all to subjectively determine their own systems according to whatever point they choose to emphasize. This led to chaos and confusion where divine celestial truths have been obscured. As the Sun moves on the ecliptic during the solar/tropical year, it moves through the backdrop of “fixed” stars [sidereal zodiac]. These two must be understood BOTH as separate celestial zodiacs, and together in a unified system. The annual solar year lacks meaning without the context of the stellar backdrop of the sidereal zodiac. On the other hand, the very long stellar zodiac lacks an application to the human lifespan associated with the shorter annual Sun cycle. As in the chart above, once the Biblical Administrations are tied to these celestial zodiacs, along with their related precessional ages, the Biblical import is clarified, and the purpose of the Heavens in God’s Plan for the Ages is further revealed, in light of the end-time prophecies of the birth and Second Coming of Jesus Christ. Once we adopt the understanding and perspective of the Biblical Patriarchs in the context of God’s Plan to restore His temporal order, we uncover the divine perspective, which has been hidden under the debris of man’s dilapidated idols in ancient history. As we recognize the story of the Coming Redeemer written in the heavens, at the root of all cultural sky myths, we can unearth the primal secrets and original symbolic truths of the Celestial Gospel in every culture, thus decoding the world monomyth. As we can see in the graphic above, the receding pole star is mapped on the smaller inner circle, along a series of four points corresponding to four axes on the larger outer circle of the zodiac. This shows us the pole star in the specific precessional ages going back to the Age of Gemini, marked on the larger zodiacal circle by the symbol “II“, prior to 4380 BC, showing the transition from the Age of Gemini to the Age of Taurus. This depicts Gemini’s position at the early stages of Egyptian reckoning of precessional ages in Dendera’s zodiac, even though the latest version of the Temple of Dendera housing this zodiac, was rebuilt in the late Hellenistic period. As the outer circle’s counter-clockwise movement progresses, we come next to the sign of Taurus the Bull, marked by one of the main axes of the larger circle in solid lines above. On the full circle of the zodiac, Scorpius is directly across from Taurus, forming one of the main axes, while Leo the Lion is across from Aquarius forming the other. This gives us a picture of the main zodiacal axes during the precessional Age of Taurus, as marked by the axes of the Dendera zodiac above. We find the Biblical version of this in Numbers 24. Lash was not alone in making reference to the axes of the Dendera Zodiac, As mentioned above, Schwaller De Lubicz is another scholar who argued in favor of the Egyptian knowledge of Precession. He points out 2 hieroglyphs on the outer rim of Dendera’s Zodiac that mark a line between Aries the Ram and Taurus the Bull, which correlates to a date around 2100 BC, indicating how the Egyptians wanted to mark the transition in precessional ages, in this case from the Age of Taurus to that of Aries. Figure 5. 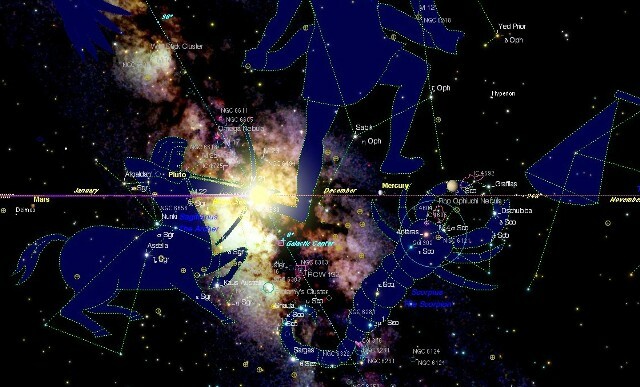 Sun’s Alignment with the Galactic rift of the Milky Way 12-21-12. This comment by Lash indicates not only the precessional awareness of these ancient astronomers, but also how the precession of the equinoxes provides a window into this galactic alignment, in the Age of Pisces. We can see more evidence of this, in the axis indicated by Schwaller De Lubicz between Taurus and Aries. As this axis extends through the other side of the zodiac, it brackets Sagittarius and Scorpius in the center of the Milky Way Galaxy, where the point of the Horseman’s Arrow is aimed into the dark rift of the galactic heart, as seen in the graphic above. To be clear on this point, the axes of the Dendera Zodiac seem to be designed to point any learned observers attention to the importance of Spica/Al Zemach and Sirius in decoding this star map. Relating to Spica, it is apparent that Axis E is pointed towards the Age of Pisces, which began with the birth of Jesus Christ the Promised seed, marked by 2 rare triple planetary conjunctions both involving Jupiter. The culmination of the Piscean Age is marked also by Axis E, at the other end of the Dendera Zodiac marking Sagittarius and Scorpius, pictured above on December 21st, 2012, even as it was marked by the Mayan astronomers, at the end of their 5th Age. This is an obvious eye-opener, which is corroborated by Lash below! The fact that this study of the axes of the Dendera zodiac lead us directly to the timing of Christ’s birth at the inception of the Age of Pisces alone, is worth the price of admission. The details of the celestial signs leading up to the birth of Christ are covered in our website study on the “Celestial Prelude” which is found under the Biblical Astronomy of the Birth of Christ section of our site. The significance of Jupiter-Saturn triple planetary conjunctions in marking the opening of the Piscean Age are laid out there, along with how these Conjunctions were also central in Mayan Astronomy. The Dendera Zodiac as a prominent artifact of ancient Egyptian Astro-archaeology it provides an independent witness to the principles of Biblical Archaeo-Astronomy, but when combined with the witness of the Great Sphinx and the Great Pyramid their collective chorus on the birth of Christ becomes nearly deafening to those with ears to hear. As we allow the heavens to have their say in declaring the manifest glory of the Creator, we will avoid the pitfalls of those throughout history, who decided to rather change the glory of the incorruptible God into any form found in Creation, be it man, animal or insect. Let’s learn our lessons from the Egyptians who stumbled on this downward path away from God’s Grace, into His wrath and fiery judgment in the Age of Moses. 1. The Companion Bible, E.W. Bullinger. Appendix 42. 3. Secrets of the Great Pyramid, Peter Thompkins ppg.169-172. This poster depicting the ancient zodiac found in the Temple of Hathor at Dendera, Egypt, provides an insight to a historical viewpoint of ancient Astronomy. This Poster shows the Great Sphinx and the Great Pyramid of the Giza Plateau, at the top with arrows forming a figure 8 extending thru the zodiac. As the arrow follows Axis E, it intersects the 2 fish of Pisces, highlighting the Piscean Age of the Precession of the Equinoxes, whose inception witnessed the birth of Christ, and whose conclusion will see His victorious return to the Earth. This beautiful one-of-a-kind poster serves as a handy study/reference aid, while adorning your walls with a unique piece of artwork. $13.00 Includes S&H, it makes a great gift for all occasions.